The North Yorkshire Moors Railway is one of the premier heritage lines in Britain, started up in 1973, seven years after the British Railways service closed down. It runs from Grosmont, the junction with the Esk Valley line, south to Pickering. It has spectacular moorland scenery, beautifully preserved stations, authentic rolling stock that is kept in good order and a fleet of powerful tender locomotives that can tackle steep gradients. Its greatest asset of all, however, is its army of volunteers. Stations and trains are well staffed, so that the public is well looked after. The railway offers a warm welcome, decent catering and unobtrusive shopping opportunities to holidaymakers and rail enthusiasts alike. Among the many preserved railways up and down the land, the NYMR is at the top of the game, alongside such lines as the Keighley & Worth Valley Railway and the Severn Valley Railway. Travelling between Whitby and Pickering and back in either direction is a full day out, and there’s time to make at least one break of journey. Grosmont station gives access to the locomotive works through the original tunnel of the horse-drawn Whitby & Pickering Railway; Goathland, made famous by the TV programme Heartbeat, is irresistibly picturesque. The re-entry of steam trains into Whitby is a huge success, and line-capacity has been improved by bringing a second platform back into use. Collaboration between the local authorities, Network Rail and the NYMR has created a win-win situation, boosting the local economy and bringing pleasure to thousands. This entry was posted in Life-enhancing experiences, Transports of Delight, Yorkshire's Seaside Heritage on August 31, 2015 by Mike Higginbottom. Whitby’s railway station is an imposing building that, like the line that serves it, has survived a succession of threats. 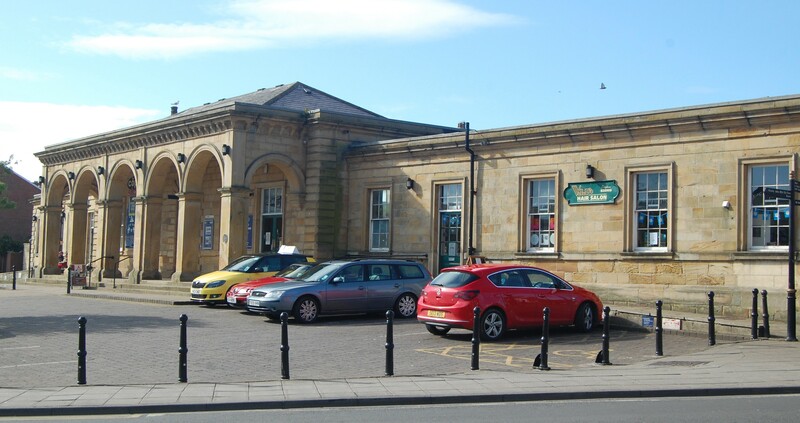 It was built in 1845 by the house architect of the York & North Midland Railway, George Townsend Andrews (1804–1855), to replace an earlier terminus for the primitive, horse-drawn Whitby & Pickering Railway, engineered by George Stephenson in 1836. From the 1880s to the late 1950s, Whitby station served four different railway lines, the original main line to Pickering and on to York, the Esk Valley line to Middlesbrough and the two coastal lines south to Scarborough and northwards to Loftus. Dr Beeching would have shut all four of them, but the difficulties of providing replacement buses in the Esk valley meant that the circuitous and picturesque line via Battersby remained open, even though an eccentricity of railway geography has meant that every train down the line has reversed at Battersby since 1954. Whitby’s rail connection to the rest of the country has been tenuous for decades, and it’s still not good: there are only four trains a day to Middlesbrough, the first starting its 1¼-hour journey at 0850. 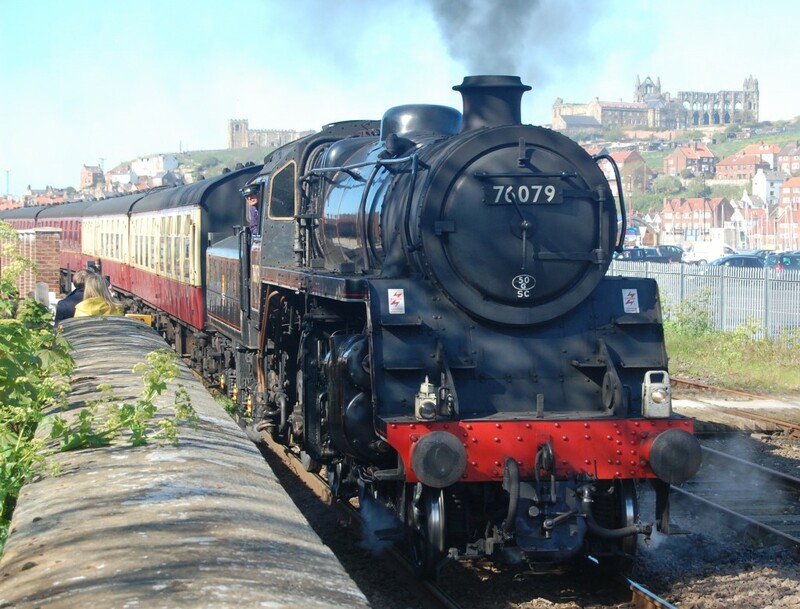 However, the enterprising North Yorkshire Moors Railway has negotiated rights over Network Rail tracks from its junction at Grosmont into Whitby, so that it’s again possible to travel by steam between Whitby and Pickering in the summer months. And you can get a proper breakfast at the Whistlestop Café in G T Andrews’ original station building. The bikers congregate there so it must be good. This entry was posted in Transports of Delight, Victorian Architecture, Yorkshire's Seaside Heritage on August 26, 2015 by Mike Higginbottom. When David Atwell wrote the first detailed account of cinema architecture in Britain, Cathedrals of the Movies (Architectural Press 1980), the front-cover illustration was of the Granada Cinema, Tooting, in south London. The Granada cinema chain was founded by the brothers Sidney and Cecil Bernstein, and they named their company as a result of a walking holiday in Spain. They employed a Russian emigré theatre-director, Theodore Komisarjevsky, to design a series of purpose-built cinemas, starting in Dover in 1930. The Tooting Granada, built in 1931, was the flagship. Its exterior shell was designed in a discreet Moderne manner by Cecil Aubrey Masey. Within, Komisarjevsky provided an utterly magnificent, Venetian extravaganza with a baronial hall and minstrels’ gallery in the foyer, a hall of mirrors in the circle lobby and a 3,104-seat auditorium with a coffered roof, Gothic tracery decoration and a cusped proscenium arch. It had, and still has, a Wurlitzer organ bought second-hand from the Majestic Theater, Sacramento, California and subsequently enlarged. All this was planted in a workaday part of south London, near the local tube station. Londoners came off the street into a palazzo of the pictures, inspired by the Doge’s Palace, the Ca d’Oro, and the Palazzi Cavalli, Pizini and Foscari. Not that they needed to know the cultural references. Komisarjevsky and his left-leaning clients believed that ordinary people deserved the best that could be provided, and economies of scale made that possible. The picture theatre supplies folk with the flavour of romance for which they crave. The richly decorated theatre, the comfort with which they are surrounded, the efficiency of the service contribute to an atmosphere and a sense of well-being of which the majority have hitherto only imagined. While there they can with reason consider themselves as good as anyone, and are able to enjoy their cigarettes or their little love affairs in comfortable seats amidst attractive and appealing surroundings. In the pre-war period the Tooting Granada could easily fill three full houses a day. It was the first British cinema to be listed Grade II*, in 1972, and the first to be upgraded to Grade I in 2000. The building is no longer a Granada. 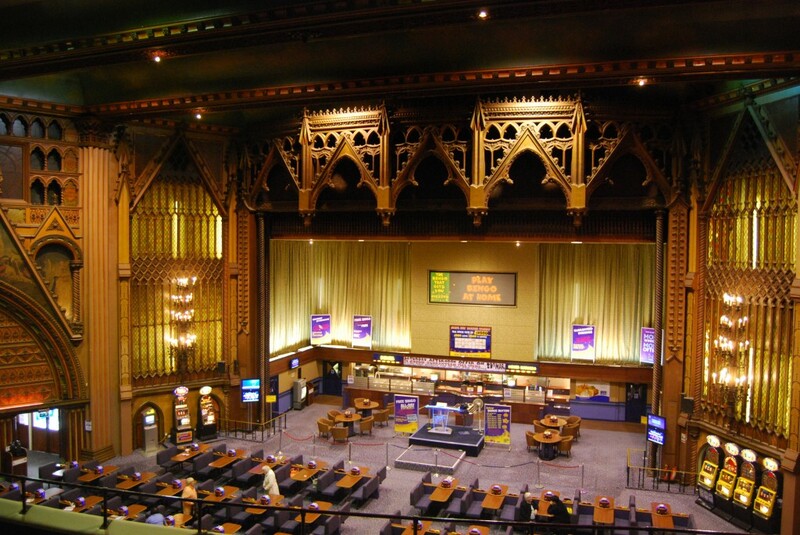 It’s now operated by the Gala Bingo chain [http://www.galabingo.com/clubs/tooting], which takes good care of it. There are images of the parts of the building that the public don’t reach at http://www.28dayslater.co.uk/granada-cinema-tooting-july-2015.t98224. This entry was posted in Fun Palaces on August 20, 2015 by Mike Higginbottom. I dislike the term “folly”, referring to extravagant and apparently useless buildings and structures. Quite often, the constructors of eccentric buildings had a purpose, and knew exactly what they were doing. The Wentworth Marquises of Rockingham and Earls Fitzwilliam constructed what are now called the Wentworth Monuments to embellish the landscape and to commemorate important events. Eye-catchers such as Deer Park Lodge at Scampston Hall, North Yorkshire, and Sir Thomas Tresham’s famous Triangular Lodge at Rushton, Northamptonshire though decorative, doubled as functional estate buildings. 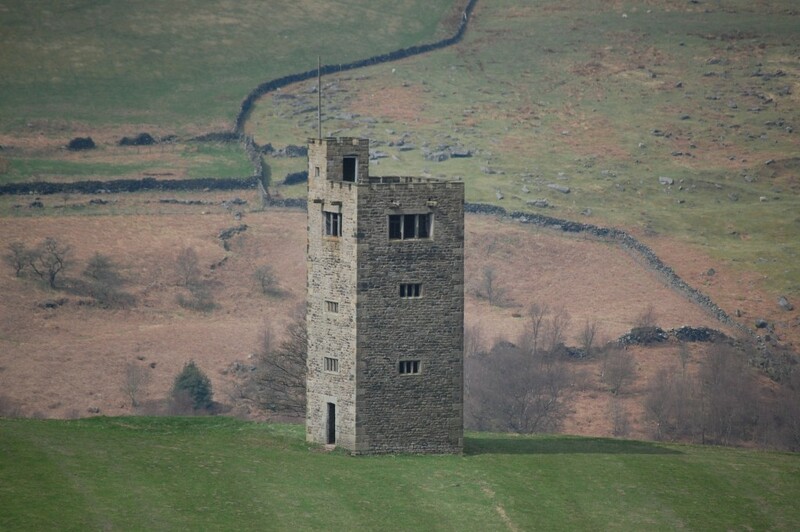 Boot’s Folly, a plain square tower, 45 feet high, that can be seen across the hills north-west of Sheffield between Bradfield and Strines, is unambiguously a folly. It stands over a thousand feet above sea-level, and is built of the stones of three demolished farms. Its builder was the canny construction magnate Charles Boot (1874-1945) who lived at Sugworth Hall in the valley below. 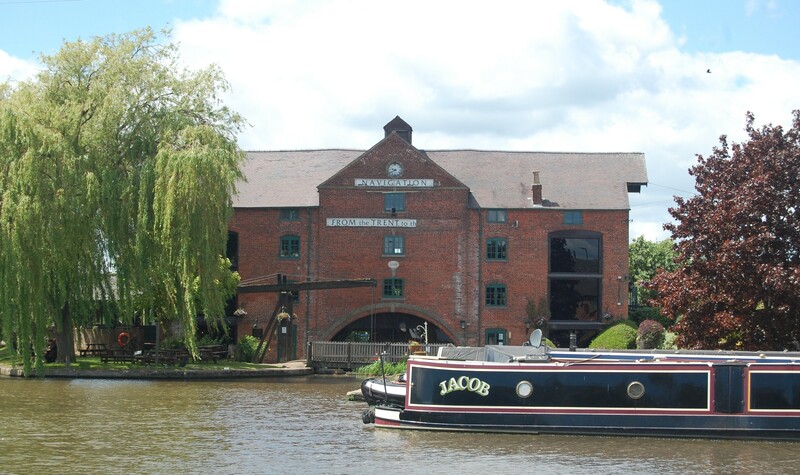 He was the son of Henry Boot (1851-1931), who founded the family company and built it from nothing. Charles took over from his father just before the First World War, made a fortune from military contracts during the war and then continued to grow his wealth through post-war construction, particularly housing in Britain and on the continent. He was also the founder of the Pinewood film studios. In the spirit of all the best follies, there’s no clear reason why he built his tower. A customary explanation is the desire to provide employment for the unemployed, like Joseph Williamson at Edge Hill or the 5th Duke of Portland at Welbeck. A more distinctive story is that Charles Boot wanted a vantage point within sight of Bradfield churchyard where his wife was buried in 1926, the year before the tower was built. Originally, a staircase led to a panelled room at the top of the tower, but this was dismantled – so the story goes – after a cow strayed up the stairs and had to be rescued with difficulty. There is a fine set of images of the tower at http://www.derelictplaces.co.uk/main/showthread.php?t=30431#.VUOvKOl0zcs. This entry was posted in Country Houses, Life-enhancing experiences, Sheffield's Heritage on August 8, 2015 by Mike Higginbottom. I’m habitually suspicious of modern art, sensing that some of it is a repository for rich people’s spare capital and much of it is artists’ scratching their imaginative itches in preference to providing pleasure for non-artists. On the contrary, I took an immediate liking to a pair of sculptures that I found installed at the entrance to Waddesdon Manor, the great French-style chateau that Baron Ferdinand de Rothschild built on a bare hilltop in Buckinghamshire between 1874 and 1889. Though Waddesdon was given to the National Trust in 1957, it is run by a Rothschild family trust, and the contiguous subsidiary house at Eythrop is the residence of Jacob, Lord Rothschild. Joanna Vasconcelos’ Lafite, 2015 celebrates the family’s connection with wine and their great Bordeaux estate, Château Lafite Rothschild. 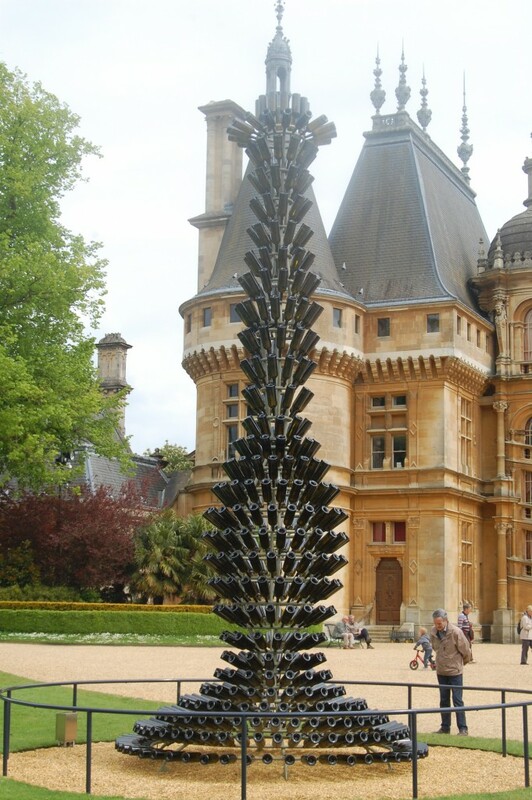 It consists of a pair of giant candlesticks composed of over a thousand magnums, neatly connecting the magnificent Rothschild fine art within the house with the produce of the family vineyards: http://www.joanavasconcelos.com/info_en.aspx?oid=3570. At night the candlesticks light up. Joanna Vasconcelos’ trademark is to construct artworks from everyday forms, such as Piano Dentelle, 2008-2011 [http://www.joanavasconcelos.com/info_en.aspx?oid=755], Pavillon de Thé, 2012 [http://www.joanavasconcelos.com/info_en.aspx?oid=2085] and Call Centre, 2014 [http://www.joanavasconcelos.com/info_en.aspx?oid=2864]. For more illustrations of Joanna Vasconcelos’ work, see http://www.joanavasconcelos.com/obras_en.aspx. Waddesdon Manor is one of the National Trust’s most popular sites, and is best visited at off-peak times: http://www.nationaltrust.org.uk/waddesdon-manor. You can treat yourself to a bottle of wine if you’ve a bob or two to spare: http://www.waddesdon.org.uk/shop-and-eat/wine-shop. This entry was posted in Country Houses, Life-enhancing experiences on August 2, 2015 by Mike Higginbottom.